Grover Walker, 84, and his family were well-known for their star-spangled stunts. Probably there never will be agreement about whether the U.S. Air Force was right when it discharged Grover Walker after claiming he was paranoid. But one thing no one could dispute: Grover Walker must have been one of the most stubborn men ever born. For more than two decades, he flew a giant flag upside down on the 90-foot flagpole in front of his Winter Park home -- painted red, white and blue -- and staged loud protests and publicity stunts that often ended with him, and his children, behind bars. His family stamped protest messages on millions of dollar bills that circulated around the world. When the county threatened to take his home after he refused to pay steep fines levied for his protests, Walker threatened to fill the house to the rafters with concrete. An Orange County official once asked Walker when he would end his protest, and he answered, "When the world ends! When hell freezes over!" But time and age did what code boards and prosecutors never could. 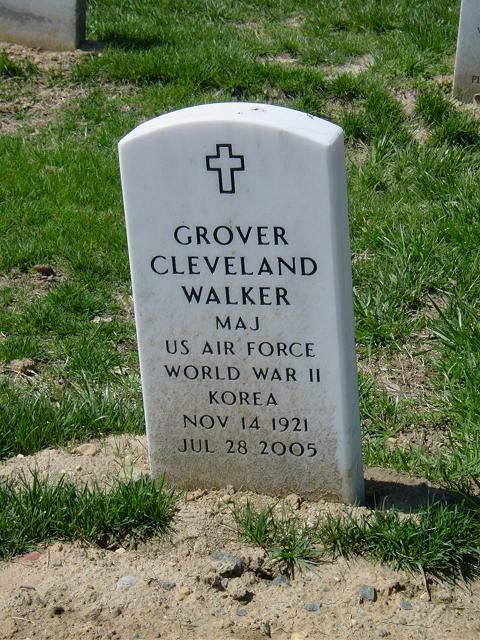 And Grover Walker's long fight to clear his name ended quietly this week when he died at Winter Park Memorial Hospital after a long illness. He was 84. At his home on Tyree Lane, just south of Aloma Avenue, his family gathered Friday to plan his funeral next week at Arlington National Cemetery. "Arlington to him is sacred ground," said his son Geoff, 47. Grover Walker's death Thursday seemed an anticlimactic end to a relentless protest that was, depending upon one's point of view, either a textbook case of exercising the rights afforded by the Constitution, or an example of how to be a pure pain in the neck. It began after Walker, a Technical Sergeant who served 25 years in the Army Air Corps and the Air Force -- much in sensitive intelligence work for which he was commended -- was honorably discharged by the Air Force in 1966. The Air Force said Walker, then stationed in Germany, was discharged because he was mentally unfit and paranoid. Walker said he was forced out because he had raised warnings about security leaks and favoritism that embarrassed his superiors. Walker moved to Orlando, where he said he had difficulty getting work because of his military diagnosis, and began pressing Congress and the Pentagon to clear his name. In the late '70s, his children took over his campaign. Their house was painted like a float in a July Fourth parade. Protest signs went up. On the giant flagpole out front, they built a platform and would climb up, even late at night, to read the Constitution or their father's demands over a loudspeaker. They spent days stamping dollar bills with protest messages. There were disputes with neighbors and with SWAT teams, and most in the family were eventually arrested. Many noted the paradox that the whole family was doing things that might be regarded as crazy in an attempt to prove that their father wasn't crazy. On Friday, as they sorted through their father's belongings in the modest home, some of Walker's seven children still debated whether they'd made the right choice. "We wanted publicity, and it backfired," said Theresa, 50. "We're just working people, poor people," said James Walker, 46. "And we did the only thing we could. We used our freedoms to get attention to our issue."